Ariana Papademetropoulos, ‘spirit of Elvis be my sugar daddy,’ 2017, oil on canvas, 60 x 60". 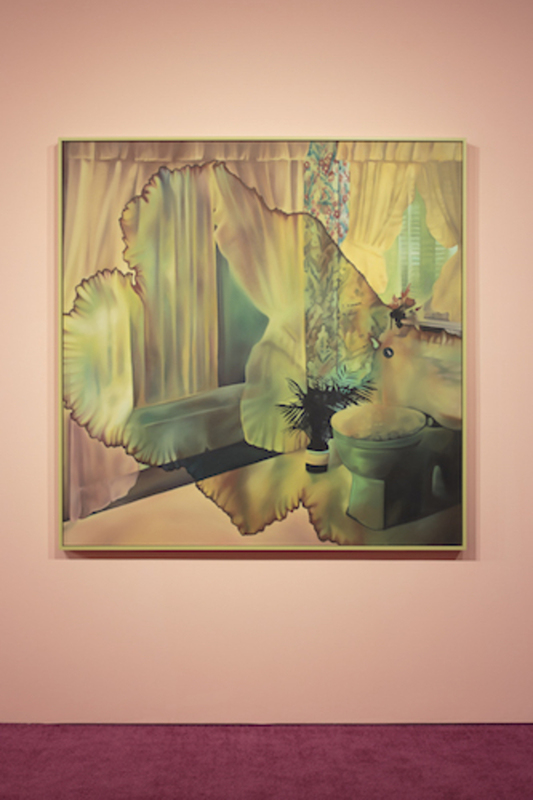 Los Angeles–based artist Ariana Papademetropoulos recasts the cult of domesticity as hallucinatory fantasy: Watermarks tear Lynchian portals into her oil-on-canvas re-creations of photos depicting retro-kitsch interiors. A bedroom suffocated with royal-purple floral fabric appears in psychedelic relief in Best thing about not dating a scientologist is that I can do acid again (all works 2017). A bile-green aperture is superimposed over a bathroom with gaudy wallpaper, golden drapery, and a porcelain throne—rather unlike the one Presley died in—for ‘spirit of Elvis be my sugar daddy.’ In this lineup, Holy Water is a breath of fresh air: The watermark disintegrates the walls of a grand venue, opening it up to a misty mountainscape; chandeliers hang from the blue gauze sky; the empty theater seats are turned away from the natural splendor.